Skipper Dan Burgoyne played a real captain’s knock as Denby 1sts claimed what could be a vital eight points in a losing draw. He guided the tail through the closing overs as Denby hung on to avoid defeat at Swarkestone. Denby, third from bottom of the Derbyshire County League Premier Division, closed on 194 for eight as they chased 235 for five. The reply had got off to a fine start as openers Chris Fletcher and Jake Smith added 88. Fletcher struck three boundaries in his 24 before he was the first to go. Smith found nine fours in his knock of 44 before he was dismissed on 106. George Burrows added 15 at number three, but Denby were reduced to 127 for four when Kudzai Oliver Maunze and Burgoyne added 39 for the fith wicket. Maunze was out for a rapid 22, including two fours and a six, at faster than a run a ball. 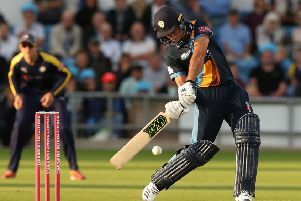 But Burgoyne then shepherded the tail, despite the loss of wickets, with an unbeaten 33 from 47 balls, featuring four fours, to make sure Denby earned the draw. Earlier, four Denby bowlers shared the five wickets the visitors took. Harry Wanford, one for 56, made an early breakthrough and Peter Burgoyne, two for 48, also helped to reduce Swarkestone to 44 for two. But stands of 98 and 68 for the third and fifth wickets respectively put the home side on top. Jack Richardson and Maunze were the other Denby wicket-takers.